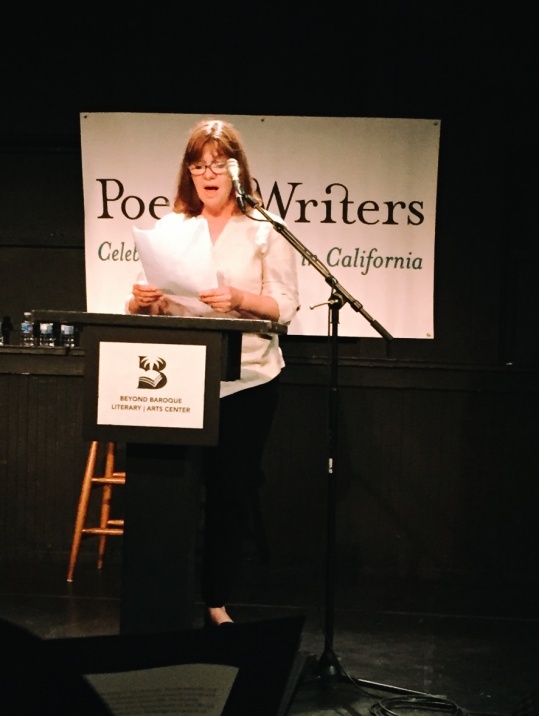 Poets & Writers' fifth annual Los Angeles Connecting Cultures Reading took place on June 11, 2015, before a packed house at Beyond Baroque Literary/Arts Center. 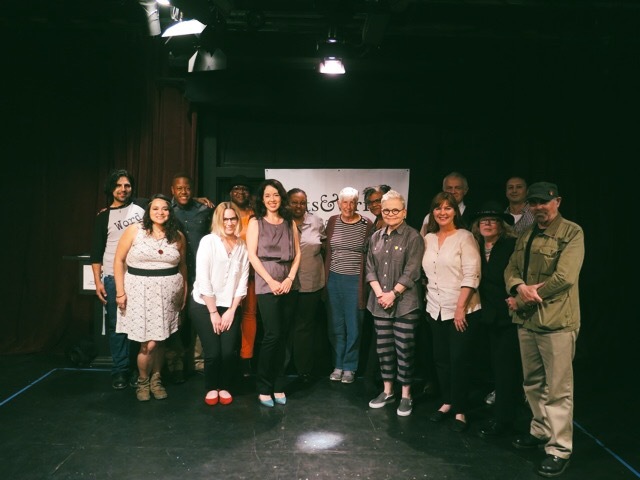 Eleven writers representing P&W–supported organizations Alexandria House, Literary Soul Symposium, Los Angeles Poet Society, Red Hen Press, and Wellness Works, Glendale came together to celebrate the diversity of the SoCal literary community and Poets & Writers' Readings & Workshops program. R&W (West) program assistant B Spaethe blogs about this lively annual event. “As I now watch from the sidelines, and see all of the remarkable women in the military today, I stand here to tell you they deserve a military institution worthy of them. They deserve to be safe.” Cheers erupted as Terre Fallon Lindseth of Wellness Works, Glendale read from her essay, “Be All That You Can Be.” Wellness Works, Glendale is a nonprofit veteran welcome center that aims to facilitate self-healing for veterans and their families and is one of five organizations who shared stories at the event. Connecting Cultures is a reading series put together by P&W’s Readings & Workshops program in both Los Angeles and New York City in order to showcase a variety of diverse organizations funded by the program. Each year, the blend is unique and this year was no exception. Alexandria House, a nonprofit transitional residence and house of hospitality for women and children, brought two brilliant readers: Sandy Fredrick, whose story explores the tumultuous world of a girl who gets caught in a drug deal, and Tabia Salimu (QueenMama Tabia) whose story gives a vivacious anthem to the power and allure of the black man. In addition, Director Judy Vaughan spoke about the rise of homelessness in Los Angeles and a need for places like Alexandria House. GLBT-supporting Literary Soul Symposium unleashed the tenacity of Toni Newman who told her moving story of transitioning from male to female. Newman’s book I Rise: The Transformation of Toni Newman is the first memoir written by a member of the African-American transgender community. Dontá Morrison also read with high emotion about the love of two men falling apart in a hospital room. Other highlights included the locally-focused Los Angeles Poet Society, introduced by Jessica Wilson Cardenas who brought Alexis Rhone Fancher, her sultry work a highlight of any event. Celeste Gainey read from her book the GAFFER, published by Red Hen Press's imprint Arktoi Books which was established by former Los Angeles poet laureate Eloise Klein Healy. Gainey's energy was infectious as she read about being the first woman gaffer to be admitted to the International Alliance of Theatrical Stage Employees (IATSE). A blog post can’t fully capture the power of these voices in one room together or the sound of pens scratching down contact information and cards swapping hands so that there can be further dialogue. At the end of the night, we felt opened up to one another. Jessica Wilson Cardenas said, "I can't wait to work with some of these writers! I've already invited many of them to collaborate with the Los Angeles Poet Society." See more highlights in these photos and videos from the Los Angeles Connecting Cultures 2015 event. Photo: (bottom) 2015 Los Angeles Connecting Cultures Group. Front: (L-R) Jessica Wilson Cardenas, B Spaethe, Jamie FitzGerald, Celeste Gainey, Terre Fallon Lindseth, Leilani Squire, Richard Modiano. Back: (L-R) Juan Cardenas, Dontá Morrison, Toni Newman, Sandy Fredrick, Judy Vaughan,Tabia Salimu, Glenn Schiffman, Ramon Garcia.